These great pull-up boots are based on original, classic designs that are recognisable worldwide. The uppers are constructed with visible quality from smooth, durable black leather.Running up each side of the 2976 mens boot is an elasticated side panel that allows for easy fitting. Branded with an embossed Dr Martens logo on the heel and edged with a double row of stitching these 2976 chelsea boots demonstrate quality on every level. 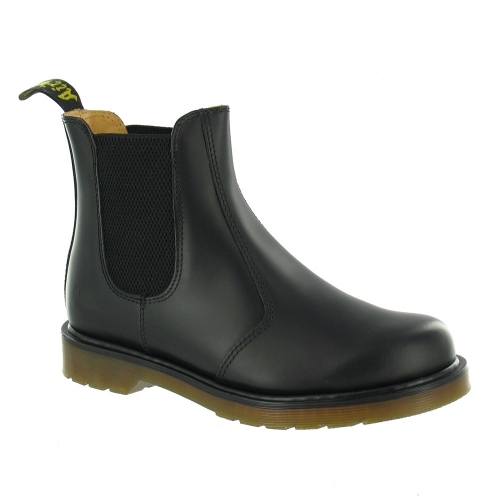 Travelling up the rear of the 2976 ankle boot is a broad strip of leather ending in a black pull tag with the Dr Martens 'AirWair Bouncing Soles' logo embroidered in yellow. Inside, the 2976 Chelsea boot is leather and textile lined with a shaped, lightlly padded insole. The Dr Martens 2976 is Goodyear-welted meaning that the upper and sole have been both heat-sealed and sewn together - not just glued while Dr Martens famous hard wearing and slip resistant sole completes this great looking mens smooth leather boot. This mens leather Chelsea boot is truly an Iconic piece of classic styling that once worn will never be off your feet!